I am not sure I really understand "creative movement" class, but I am sure the grandmas will want to see this video. Just feet away from her sister Maria's tiny white coffin, Shaohannah Chapman stood with her parents and listened as her daddy read a letter she wrote. It was addressed to two people up above: her sister and Jesus. "Maria's stuffed animals are going to be packed away and put into the attic," Steven Curtis Chapman, a well-known Christian singer/songwriter, read in a steady voice that sometimes trailed off into a whisper. "Enjoy heaven," he continued, addressing some 2,000 mourners Saturday at his 5-year-old daughter's funeral at Christ Presbyterian Church in Nashville. "I will see you soon, but not too soon. I hear the roads are made of solid gold and God waits for everyone. When you see that I'm coming, wait for me at the gate," he continued as Maria's pictures — smiling in huge sunglasses or sitting next to her birthday cake — flashed on two screens behind him. Shaohannah's was one of many tributes to Maria, a little girl described by her parents, siblings and friends as a "snuggle bunny" who loved to run around naked, draw flowers and play princesses. She died Wednesday evening after what authorities called a "terrible accident." One of Chapman's two teenage sons was backing down the family's driveway in a truck. He didn't see the child in the driveway and struck her. She was pronounced dead later that day at Monroe Carell Jr. Children's Hospital at Vanderbilt. 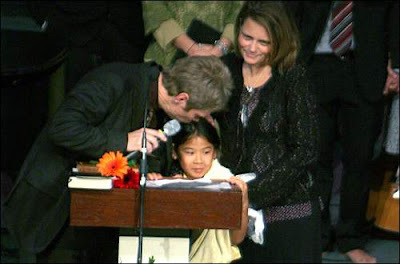 The little girl was one of Chapman's three adopted daughters from China and joined the family in 2004. Chapman and his wife, Mary Beth, also have three biological children. They were celebrating the recent engagement of their eldest daughter, Emily. The Saturday service, sometimes pierced by spontaneous laughter from the pews caused by funny Maria stories, also served as a reminder that another life, that of the teenage boy who drove the truck, has been shattered. "I haven't always been a good brother," one of the Chapman boys said. "Just like my dad helped Maria, I hope I help my brother. … (God) healed Maria in a way we don't like, but he's going to heal (my brother) in a way we're going to like." Those in the sanctuary got up and applauded. And then Chapman recalled how he tried to fight for his little girl in the hospital, how he told the doctors he needed to pray, he needed to save her. "That's what you do as a dad," he said, his voice breaking up. And how he asked God for a sign to know that his daughter was OK, and the frustration when it didn't come. Not right away, he said. And then he found a card Maria painted but never finished. When he turned it around, it read "see." "I heard her little voice and the voice of God," he said. "She said: 'See, dad, it's OK.' "
I don't know why this story has gripped me so much. Maybe it is because I have children, maybe it is because I have thought of death more these past few months and tarried on the edge of the fear of it, maybe it is because the Chapmans seem like such a normal family... I don't know why it has grabbed my attention, but I have to say that I am so thankful for a Savior who has defeated death, but who also showed his own sorrow over it while he walked this earth. I would like to direct you to Rodney Olsen's blog. He has a great write-up concerning the Chapman family. And I’m sittin’ here wearin’ the weight of the world on my shoulders. She’s pulling at me saying “Dad I need you! Here is the acoustic version of that song. I know that I am not the first to mention this, please pray for the Chapman Family. My wife and I have been thinking about them and praying for them all day. My heart especially goes out to the son. If you haven't read yet, please stop by StevenCurtisChapman.com to read what happened. I would also like to suggest that you stop by the blog, In Memory of Maria, as well. Here is a video from that site. with which our souls can be satisfied. than the most pleasant accommodations here. but God is the substance. but God is the sun. but God is the ocean. This was a gift from a student, I thought I would pass it along to you. Our school has its new site up and running! I can't tell you what a relief this is. The old one was embarrassingly out of date. We didn't want to send people to the site because it didn't represent our school very well. So... Click on it already. Here is the code for my all new chalkboard looking <blockquote>! Now that I have my <blockquote> fixed, I want to share a good quote with you. "I can safely say, on the authority of all that is revealed in the Word of God, that any man or woman on this earth who is bored and turned off by worship is not ready for heaven." I love A. W. Tozer's quotes. I pulled this one off of the wall in my room. I have printed out quotes and stuck them all over my room. Most of the time they don't get noticed, but every once in awhile I will see a student browsing my quotes. I am going to try out a new blockquote style. I don't really know what I am doing, so ignore this post. My wife and I will use this phrase from time to time, "The Way of the Cross..." We will use it in sentences like, "The best way to go is the way of the cross..." or "I have just decided that I am going to go the way of the cross..."
We asked ourselves this question the other day when things weren't turning out quite right in a situation. Was this way of the cross really what we were hoping it would be? Now that we are thinking about it, did the way of the cross end up all that well? We know that ultimately it does, but what about in the here and now? Doesn't the way of the cross lead to ... a ... well to a cross? Isn't there a certain amount of sacrifice and death associated with His way? Maybe that is why Jesus said, "...take up your cross daily, die to self, and follow me..."
But. But there is not other way. And in the end... What a wonderful way it truly is. Have you seen this Dunkin Commercial? I just bought Keith Green the live experience CD/DVD Combo. I went into the store to buy my wife a CD for Mother's day. While I was back browsing the CD's I noticed this one out of the corner of my eye. I am recommending it because I absolutely love it. I have always loved Keith Green. And even though I didn't start listening to him until after he had died, he was still a major influence in my life. His music opened my eyes to a much different perspective of Christianity than I was completely familiar with. His message is still impacting me. So, I heartily recommend this CD and DVD. Especially if you are already a Keith Green fan, you will really enjoy this. There should be some clips on the right hand column of this blog. If there aren't, please drop me an e-mail. The first dog I can remember was named Smokey. I am not sure what happened to Smokey. He simply faded out of my most ancient memories. I don't recall anything specific about him, other than the fact that I owned him and now I don't. The second dog I owned was named Smokey (Or Smokey II, if you will...). He ran away more times than I can remember, but always came back. At least he came back everytime but the last time. The last time he got away was the last I ever saw him. The third dog I owned was named Norman. I picked him out of the pound, all on my own, while my parents were away on vacation. More than once a day he would knock over my little sisters and make them cry. Then he chewed a piece of siding off of the garage and made my dad cry. (Actually, he didn't really cry. It was sort of like a pot of water coming to a boil.) We got rid of Norman, which is a funny story on its own, but I don't have time for it here. The fourth dog was named Sophie. I am not going to lie to you, I loved Sophie. She was a good dog. She was run over by a Ford Explorer (front and back tire) and survived. She taught me about loyalty, despite treatment, she gave me great practice with parenting, and she showed me that I had an anger problem. We had to give her up because of our busy schedules. The final dog came by way of a Christmas present to our children, and a friend of my wife's. His name is Milo, and I have to say that that I have grown fond of this dog, though I swore I would get attached. 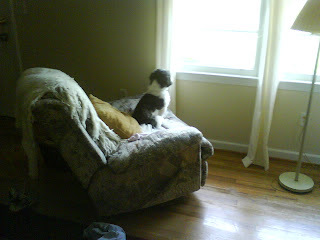 What is more important, and what has inspired this post, is the dog's fondness to me. To be sure, he will eagerly await all of us to arrive home at the end of the work day, but once I arrive, he becomes my shadow. He will follow me room to room and find comfortable spots that are as near to me as I will allow. The picture shown at the top of this post is a picture taken when I was gone on my trip to Charleston. My wife sent it to me, telling me that is how he had been sitting throughout the night. I am not putting too much into the thoughts and sentimentalities of dogs, but I have to say that it paints a great mental image to our own eager expectations of Christ's return. Do you sit at the window, anxiously awaiting Him? Is the one thing you want, to sit at His feet? Are you yearning to be His shadow? He which testifieth these things saith, "Surely I come quickly." Amen. Even so, come, Lord Jesus. What Would a Mom Say? I saw this on TV somewhere. Then I heard it on the radio the other day, but Greg Adkins found it on YouTube. Here are a few web sites that I use regularly, that you may or may not have heard of. Remember the Milk is great for those of you who like the to-do lists and also like quippy little names for websites. It is a great organizer and it also coordinates with your Gmail and Google Galendar. There is also an offline feature that comes in handy. I highly recommend this site. Jott is awesome. I cannot tell you just how awesome it is. It is a phone service where you can call in and it will transcribe your voice into text, but that isn't even the half of it. You can also send jotts. I can call and it will send a text message to my wife. OR... I can call and send a jott to myself. It will send me an e-mail of my words. But before you hang up, it will ask you if you want a reminder. If you say yes, then you can pick the date and time for that reminder. It will then send you a text message at that time. Cool. Jott also coordinates with services like Google Calendar, Remember the Milk, and Blogger, just to name a few. Grand Central was purchased by Google last year. I guess they aren't taking any new users right now, which is too bad, because it is really cool. It is one phone number for all of your phone numbers. If you call my Grand Central number, it will ring all of my phones. If you are one of my contacts, you will get a personalized voice mail message and maybe even a personalized ring. All of my voice mails through Grand Central will go to my Gmail inbox. Check out some other features of Grand Central. While on a field trip, you must maintain control of students at all time. This is an absolute imperative. Control must be maintained!